We adore our clients, make no mistake. Many of them stay with us over a period of years, and we grow to know a great deal about their academic and even personal lives. When there's a problem, they know we'll get it fixed. 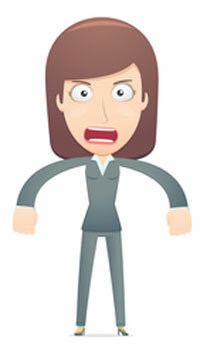 But every now and then a client comes along who panics when things go awry. Things get especially crazy around finals, when the pressure is ramped up for everyone. Here are some of the choice threats unhappy clients have made against the writers they blame when they are losing their cool. In the age of online everything, one of the first things angry clients say they'll do is tarnish the name of the writer on the web. "The writer has not given what I asked for. This is not funny. I am graduating this term and I need the paper as I asked for it now!!! The writer must know if the correct paper is not here when I wake up I will post about this everywhere!" Unfortunately the client had offered very few directions on a super rush project, so the writer just had to do her best. Once the client calmed down, we were able to get more specifics, and with a few revisions he walked away a happy customer. But we wonder-where is the "everywhere" he meant to post his comments? Does Yelp now have a section of model term paper reviews?! "I'm warning everyone about how bad she is, and she will lose all customers." Actually, the writer continued to work with us steadily for another two years, with few complaints; it's easy to overestimate the power of a few negative comments online." "Believe me, I will make sure no one will ever work with [name omitted]. I hope she starves." "I hope she starves" seemed like a bit much, considering this was a 7-page undergraduate English composition paper. "I stated it must be a writer that knows how to do a white paper. Does he know what a white paper is or not? I will not pay for any revisions because he said he could do a white paper, and all the revisions are to make it more like a white papr. Tell him redo this ASAP as a white paper, or I will leave comments about how bad this service is on every site I can think of. To be clear, it must be in its format and content much more like a white paper." "The writer and her stupid writing is (sic) going allll over the internet." There were more l's in allllll in the original. "I hope the writer kills herself after she reads the review I just posted." We notified this client that we would not ever work with him again. "I have used your service many times, and you have always done right by me. But where did you get this guy lol? There are maybe ten in-text citations in the whole paper, which is supposed to be graduate level work. I'm sorry, but I am going to review this site on a grad blog and make sure everyone is warned about this guy. I hope you don't let him do any more graduate work." As far as angry complaints go, this one was pretty polite. (And how intriguing to know there's a grad blog out there where people are writing about us!) It turns out the writer-who had done some great work for us at the undergraduate level--really was in over his head in this case. Luckily, the client gave us a chance to make things right and has remained a loyal customer. "This is not acceptable. I paid good money for this paper that is worthless. The writer has ruined my average. I am going to ruin her reputation!! I have thousands of FB friends, here and London, and 690 followers on Twitter. She is going to be very sorry that she did not even try to do a professional job." Staff reviewed the paper and found it was actually a fine, professional job. Still, 690 Twitter followers is impressive! When not promising to besmirch writers' names online, angry clients sometimes go for the threat of a lawsuit. "I paid for this to be delivered ON TIME because I needed it ON TIME. And because your writer was late I had to take an incomplete, I had no other choice, which is very stressful. If the finished paper is not given to me by the new, absolutely final deadline, I will be speaking to a lawyer." We were impressed that this student doesn't just have a lawyer, he has lawyers, plural! Still, as we informed him, we only provide model papers and don't control what the student turns in. Therefore, we cannot and do not guarantee outcomes. We suspect his lawyers understood. "I demand the writer's full name and contact information asap to send my lawyer." We suggested we would respond to this request when we heard from her attorney...which we never did. "Has [the writer] even noticed that I'm pre-LAW?? Duh. I'm learning how to sue people like her." Another suit that hasn't yet materialized-perhaps once the student gets to law school? "Although still an undergraduate, my son pursues vitally important biomedical research. This is research that you and your children will benefit from. I cannot allow something so trivial as an English paper to interfere. If the paper is late and his research opportunities are compromised due to a bad grade, I will not hesitate to explore legal options." This one was amazing in just so many ways! First-it came from MOM. (Though, surprising as it may seem, we do hear from parents from time to time.) Second, the paper was not yet even late! But we duly notified the writer that big issues were at stake. "I am very upset your writer has completed several ‘model papers' for my daughter. She has only been away from home for a year and is still learning how to deal with things on her own. This deprives her of the opportunity to gain confidence and self-esteem. I am considering legal action for the harm you and your writer have done to my child." Another parental note-though absolutely the only one of its kind we have ever received. We suggested therapy. "My dad is a lawyer, ok?" "My father is senior partner at a major New York law firm. Do you have any idea what that means?" Wow! But, no, we don't. Was he not able to make it to your birthday parties as a child? "Mom-lawyer. Dad-lawyer. Brother-lawyer. I don't have to pay a penny to sue your asses off." Plus, we bet you got really nice Christmas presents! "You'll be hearing from my dad whose (sic) a lawyer." We never did hear from him. "My dad's a lawyer and he knows I use your service, he pays for it, so don't think I won't tell him if I don't get the paper tonight!" She would have gotten the paper, lawyer or not lawyer. "Tell that writer, both my parents Are IN Law. Maybe then he would not f**k with me more." To be fair, the writer was not trying to f**k with anyone. The client's instructions were just very, very hard to understand. "At this point, the writer is lucky if I don't sue." Wait, please tell us again: what is it you would be suing for? Then there are clients who threaten the writer with the prospect that they (the clients) will endure massive suffering. "Tell her I can't eat, I can't sleep. I can't do anything waiting for this paper. Tell me when it will be done already!!!" Sometimes clients become the most frantic when the problems are relatively minor. This paper was delayed by just half a day. "This is awful. I've never had so much stress, he should know how much stress this is causing. This is graduate school, my career is on the line. Please! Can you try impress the importance of this on him?" The writer knew it was stressful, having completed a grad program himself. The thesis was finished in time! "I want you to tell her how much trouble she made for me in my life. I hope she loses sleep because I know I have." Here we see the slide into hyperbole...the writer is ruining the student's whole life. "My life is a total mess because the stupid writer cannot read the stupid instructions and follow them." This would be hyperbole with a little edge of nasty. "This is seriously driving me over the edge. I CANNOT WAIT ANY LONGER. Tell the writer to finish the paper and get it to me now, or I will have a serious nervous breakdown." We really feel for clients who are under this amount of stress. Usually we suggest they take a walk and get out for a bit-and seek support if they really are feeling on the edge. "If she does not get this paper to me asap I will have a nervous breakdown." "This literally about to cause me to lose my mind. Does the writer have any idea? Is that what she wants?" We hope that she literally was not about to lose her mind. (A mind is a terrible thing to lose!) But in any case that was definitely was not what the writer wanted-she was doing her best to get a tough project done. "I understand her mother died, and I really am sorry about that, but I paid for this service so I would not have to worry and get my paper done in time, and she should not make me suffer because she is suffering." We did offer to switch to a different writer when this writer unexpectedly suffered the loss of her mom--but the client was adamant about keeping this writer, whom she had worked with before. So the level of empathy here left us a little underwhelmed. "I'm not trying to be dramatic but I think the writer does not know the stress she is causing for me, and I think if she could see what it feels like and how stressful it is, maybe she would get it done already." "I can't concentrate on any of my other classes because of this. He should know he is ruining my entire GPA." We are pleased to report that the client got an A in the course and managed to rebound quite nicely as soon as the paper was delivered. This was really just a case of the jitters. "I will die if I do not graduate, and my death will be on her conscience." We are not a therapeutic service, so it is a little worrisome when threats like this come in. To be on the safe side, we suggested this student seek support. "Does she have any idea what it is like to go to school, work, take care of my mother, who can't do anything for herself at this point, and then have to deal with this crap on top of everything? She should think about this and quit asking me questions and just do it the way I asked." As a single mom with her own ailing parents, the writer did have some idea. But sometimes we need to keep asking the client questions to make sure the paper gets done right. "Ok, but when my kids want to know why they're getting spaghetti the third night in a row, the writer should know it's his fault." The writer thoughtfully sent along his own recipe for 20-minute chilli, which we decided it might be best not to forward. Then come the fantasies of personal confrontation. This is an online business, so unhappy clients never get the satisfaction of venting directly to us or the writers in person. We suspect this might be the genesis of the confrontation fantasy. Writers go by their first names and do not use their personal emails for work, so there is little prospect of a disgruntled clients actually tracking a writer down. But they do imagine it sometimes. "I can tell you now it would take me 10 min to hack your system and figure out where she lives. Maybe I should just show up in person to get the paper?" We have never been hacked as a matter of fact-and the client wouldn't have found the writers' personal data online even if he had managed somehow to break into our system. "Give me her number, am pretty sure I can get her to send it." We did not give the client her number, since that's not our business model. But we reassured him that the writer had got the message loud and clear. "I demand to speak to the writer on the phone." "I know the writer is in NYC. I'd like to know where? Sometimes you have to talk to people in person so they know you are not kidding around. I think I've earned that right." "He's crazy if he thinks I'm paying to revise after he totally screwed it up. I swear to god, I will mess this dude up if I ever find him." Luckily, this won't ever happen. "If she weren't a female I'd track her down and beat the sh*t out of her." This client also was informed that his business was no longer welcome. "Just very concerned that we haven't heard back from her for 2+ days! I admit I feel like I want to just get her somehow and shake her. But I am trying to be a good Christian here, and I know she is doing the best job she can. I am praying for her." We weren't sure if the praying was part of the revenge or not, but as things go, this was a pretty harmless little revenge fantasy. "Can't you just lock her in a room until she gets this thing done? I mean, feed her and everything :), but you have to force her to focus." Maybe, heh, tie her to a chair. Um. Is it just us, or is this one really weird? Tying to a chair was already out of bounds, but "heh" has a way of making everything sound extra creepy. "My kids and I have this list of people that we want to shove peanut butter down their pants. [Name omitted] is going on it now." We thought this was the single cutest revenge fantasy ever-and we went right out and made a peanut-butter-down-the-pants list for ourselves! We recommend you do too; it's highly therapeutic.